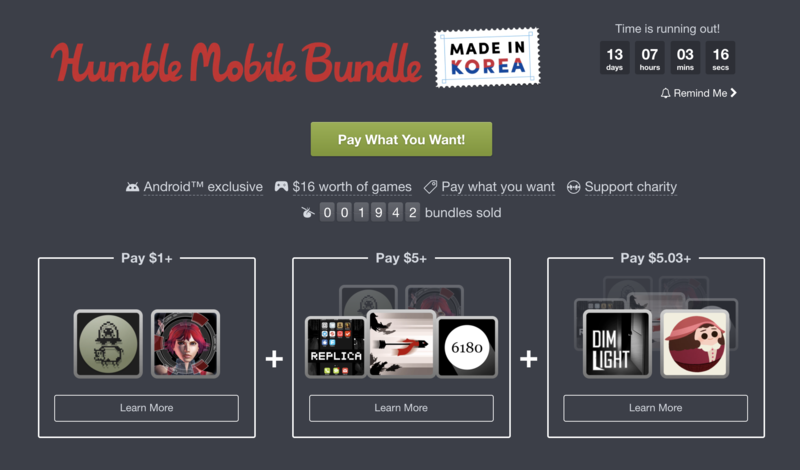 The latest mobile gaming offering from Humble Bundle is live and to continue the country theme after the recent Made in France set, this time around its celebrating games Made in Korea. As with every Humble Mobile Bundle, you get what you pay for, with pricing tiers this time giving you 2, 5, or all 7 games, depending how much you fork out. If you only want to spend $1, that will get you old school LCD-style shoot'em up I.F.O and stealth action game the SilverBullet. Pay $5 and you'll get those two games plus point-and-click adventure Replica, abstract storyteller REDDEN, and unique space platformer 6180 the moon. If you level up and beat the average ($5.02 at the time of writing, and that's for $16 worth of games), you'll get all of that as well as horror adventure Dim Light and beautiful puzzle-platformer Sally's Law. The latter won Google Play's best indie game of the year in 2016. As always, the games come DRM-free, and there's a bonus of the REDDEN soundtrack thrown in, too. Each game will likely have different system requirements, so check that they will all work on your device before you make a purchase. You'll also get to choose where your money goes, with portions going to the game developers, charity, and to Humble Bundle. Action Against Hunger is the featured charity, but you can also change it if there's another in the directory you'd rather give to.